Alice Ann Munro (/ˈælᵻs ˌæn mʌnˈroʊ/, née Laidlaw /ˈleɪdlɔː/; born 10 July 1931) is a Canadian short story writer and Nobel Prize winner. Munro's work has been described as having revolutionized the architecture of short stories, especially in its tendency to move forward and backward in time. Her stories have been said to "embed more than announce, reveal more than parade." Munro was born Alice Ann Laidlaw in Wingham, Ontario. Her father, Robert Eric Laidlaw, was a fox and mink farmer, and later turned to turkey farming. Her mother, Anne Clarke Laidlaw (née Chamney), was a schoolteacher. Munro began writing as a teenager, publishing her first story, "The Dimensions of a Shadow", in 1950 while studying English and journalism at the University of Western Ontario under a two-year scholarship. During this period she worked as a waitress, a tobacco picker, and a library clerk. In 1951, she left the university, where she had been majoring in English since 1949, to marry fellow student James Munro. They moved to Dundarave, West Vancouver, for James's job in a department store. In 1963, the couple moved to Victoria, where they opened Munro's Books, which still operates. Ann Close and Lisa Dickler Awano reported in 2006 that Munro had not wanted to reread the galleys of Runaway (2004): "No, because I’ll rewrite the stories." In their symposium contribution An Appreciation of Alice Munro they say that of her story "Powers", for example, Munro did eight versions in all. 1 2 3 Preface. Dance of the Happy Shades. Alice Munro. First Vintage contemporaries Edition, August 1998. ISBN 0-679-78151-X Vintage Books, A Division of Random House, Inc. New York City. ↑ Meyer, M. "Alice Munro". Meyer Literature. Archived from the original on 12 December 2007. Retrieved 21 November 2007. 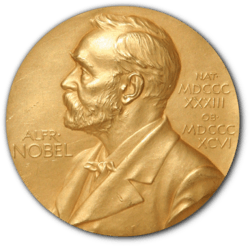 1 2 3 4 "The Nobel Prize in Literature 2013 – Press Release" (PDF). 10 October 2013. Retrieved 10 October 2013. 1 2 Bosman, Julie (10 October 2013). "Alice Munro Wins Nobel Prize in Literature". New York Times. Retrieved 10 October 2013. 1 2 "Past Writers' Trust Engel/Findley Award Winners". Retrieved 7 April 2014. 1 2 Jason Winders (10 October 2013). "Alice Munro, LLD'76, wins 2013 Nobel Prize in Literature". Western News. The University of Western Ontario. ↑ "Past GG Winners 1968". canadacouncil.ca. Retrieved 10 October 2013. ↑ "Past GG Winners 1978". canadacouncil.ca. Retrieved 10 October 2013. ↑ "Alice Munro wins Nobel Prize for Literature". BBC News. 10 October 2013. Retrieved 10 October 2013. ↑ Saul Bellow, the 1976 laureate, was born in Canada, but he moved to the United States at age nine and became a US citizen at twenty-six. ↑ Panofsky, Ruth (2012). The Literary Legacy of the Macmillan Company of Canada: Making Books and Mapping Culture. Toronto: University of Toronto Press. ISBN 9780802098771. ↑ "Munro follows publisher Gibson from Macmillan". Toronto Star, 30 April 1986. ↑ "Alice Munro unlikely to come out of retirement following Nobel win". CTV News, 11 October 2013. ↑ Which of the stories have free Web versions. ↑ For further details, see List of short stories by Alice Munro. 1 2 3 Lisa Dickler Awano, Kindling The Creative Fire: Alice Munro’s Two Versions of "Wood", New Haven Review, 30 May 2012. ↑ Harrison, Kathryn (16 June 2002). "Go Ask Alice". New York Times. Retrieved 15 July 2016. "Alice Munro collected news and commentary". The Guardian.